My buddy and I have been working on a shmup / RPG hybrid and we're about to transition from out of Early Access on Steam. It's currently still available in its Early Access from, even though the game is pretty much finished and polished, ready for full release. We're just getting final feedback from users. 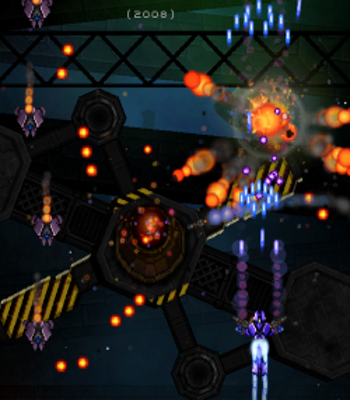 The game infuses classic old school shmup bullet hellish action with a deep RPG style progression system - tons of abilities, upgrades, spells, weapons; hordes of different enemies, and epic boss battles. Here are a few screenshots and action gifs. If this sounds like your kind of thing, please check it out and leave some feedback! Last edited by AgileMaster on Thu Jan 03, 2019 4:59 pm, edited 1 time in total. Update - we've added all kinds of graphical improvements and also some new enemies, spells, and upgrades. 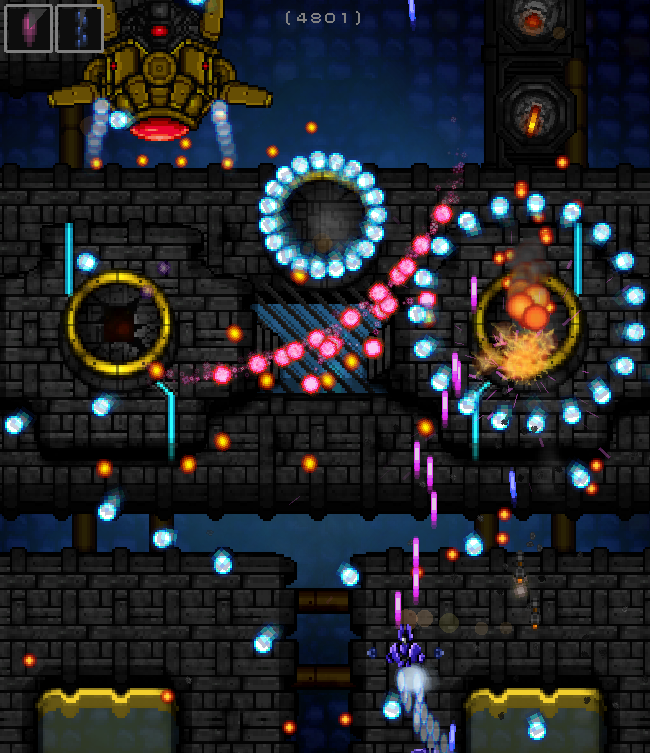 On the left, Fusion Nodes - they create walls of pink deadly laser when they are close enough to each other. 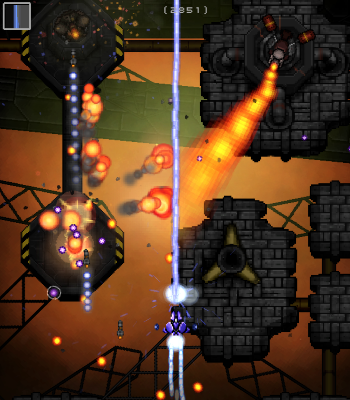 On the right - Cruiser Ships, firing sneaky 2-step diversion bullets. Hard to dodge! New dashboard graphics! To fill in the boring negative space that many of our Early Access users have been nagging about. Hopefully the full out-of-early transition on Steam will happen later this month, fingers crossed! I just played the demo of this, because of the link in that other thread. First things first, it controls well, the analog stick controls are unusual for a shmup but they work fine. It is visible that you put effort into the game, but it seems to me that a lot of the core game is lackluster. The levels lack flow, the way the enemy patterns are set up are quite boring in most cases, and the majority of the bullet patterns are either slow spam which gets in your way or very easy to dodge. I played through the demo on Normal which was very underwhelming and then played the first 2 levels on Impossible, which I reckon some of the better players on here could clear as well. The reason why it looks impossible is not because there is a lot of stuff on screen, it is more that it is a lot of stuff that is badly designed. Look at the Ultra modes in Mushihimesama and Mushihimesama Futari. There is TONS of stuff on screen, it is super hard, but it is not unfair. It is doable if you really want to stick with it. 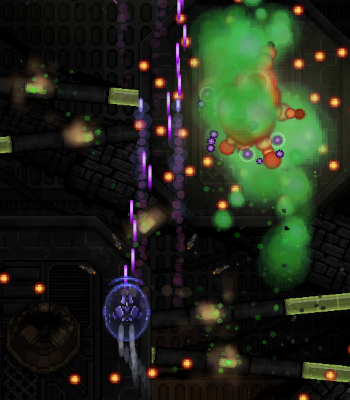 IMO, a bit part of this is designing a shmup with health. If you design your game so that you die in 1 hit you have to make sure that it is doable without getting hit at all. 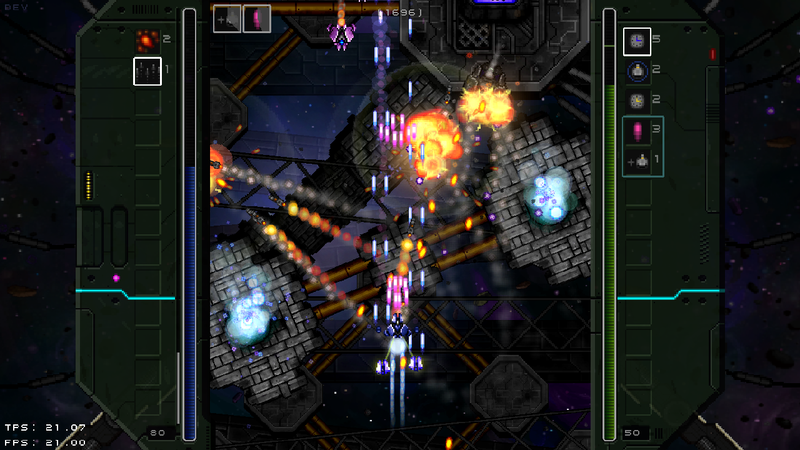 In your higher difficulty levels that might be impossible, and in a shmup, some might argue, this is bad design. I'd would agree with that as well. Lots of levels and upgrades are no good if what you got is not engaging. This is probably also why you did not get any replies in the thread. I would venture a guess that most people on here don't find this very interesting. I hope I am not coming off as too harsh, again, I can tell there is effort. But maybe you should put more effort into learning about the history of shmups, playing the classics, as well as modern ones, and try to analyse what makes them work (as well as things that might not work all too well, especially in some of the older ones.) You have to understand something before you try to innovate. Thanks for the feedback man! There's no such thing as too harsh criticism we are at the end of our early access now (me and my buddy, we are doing this together as a hobby) and we are getting a lot of support and criticism of all forms, and everything helps - we are trying to take everything on board. All of which doesn't mean we can't learn more from shmups and danmakus though - I'm gonna look into that a bit more, it's good that you mentioned that. It might indeed be down to bad level and enemy design, as you say, in terms of what a good shmup should be - how it should be designed. But also I think (or I'd like to think!) a big part of the problem is that the real interesting challenge of the game only comes out in the later episodes: because the game is structured like an RPG in terms of its character progression (start really weak and slowly build up your character), the first 10 or so levels really serve as an introduction, so as not to be too overwhelming while players get used to the dynamics of the game. Which means on most difficulties it will be pretty easy, boring even, just like in an RPG when you set out; and on impossible the only times when it will really be challenging is likely to be slightly frustrating, as you say. Later on that changes - you will find even on normal mode, there is often a LOT of stuff on screen - and also the different enemies and attack patterns become more interesting. All of which obviously means that having a demo with only the first few levels doesn't really do us that much good! (better than nothing i guess? I've considered making a different demo, with only one level, but later on, and you're already kinda powered up, so you can get a feel of what the real action feels like) ...and I obviously won't expect you to buy the full game if you didn't really get into it - but it's a shame because I'd really like to know if you will still experience those issues that you mention, later on in the game. BUT the fact is that you are experiencing them at all - probably you would have put the game down by now even if you had bought it, being demotivated? - that's a concern anyway, obviously. I think unfortunately for us many traditional shmup players will feel the same way. It's weird but really we designed the game more with RPG players in mind, and we didn't really think about market or success etc when making it, and we totally didn't do a lot of shmup or danmaku research, as you suggest - I have to be honest. We just winged it. So all of that is a bit all over the place. On the bright side, we are also getting some really good feedback on steam, presumably though from people who are not that familiar with the danmaku genre I guess we'll have to be careful exactly how we market and to whom! but yea man thanks for trying it and thanks for the feedback either way!